Kids love to collect! Many kids have collections of wonderful items they’ve found in their playtime travels. Is that piece in your child’s collection a geode, a trilobite, a fragment of fossil coral, or something else entirely? Learn the answer through a brand-new exhibit called The Great Collectors & YOU. The exhibit opens July 28 at the Putnam Museum and Science Center, located at 1717 W. 12th St., Davenport, Iowa. Kim noted that while Putnam staff members can offer suggestions on how to store and care for collection items, they cannot assign monetary values to items. “For a price assessment, one would need to consult an independent appraiser,” she said. At the exhibit, you can also discover artifacts gathered by some of the most prolific collectors from the Quad Cities area. You will view rarely-seen collections assembled by the Putnam Museum’s early contributors, such as the Palmer, Ficke and Figge families. Among the items brought forth from the Putnam’s vault for this exhibit are a Buddhist shrine collected by C.A. Ficke, African specimens and artifacts collected by the Figge family, and much more. Your Trading Place lets you take an active role in learning about your collection items. Simply bring an object from your collection to Your Trading Place and share the story behind it with staff members, who can then provide more information. Collectors of all ages can also conduct their own research, using resources within the exhibit. If you wish, you can trade your item for another found object from the many available, or take it home with a greater appreciation of its history. 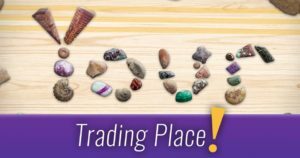 Items that can be accepted for trade include leaves, seeds, mounted pressed plants, wood samples, shells, dried cocoons, antlers, snake skins, turtle shells, clean dried animal teeth or bones, dried or pinned insects, rocks, minerals, and fossils. Please note: Your Trading Post does not accept live animals, protected plants or animals, taxidermy mounts, large pelts, anything decayed or with flesh attached, specimens or objects removed from protected lands, archaeological material, or Native American artifacts. Also, if it’s too big to carry, it’s too big to trade. Limit is two trades per session. We discourage the public from dropping off items. Items dropped off become the property of the museum. Your Trading Place is open Saturdays from 1 to 3 p.m. or available by appointment. To make an appointment, call 563-324-1933. For more information about current and upcoming events, exhibits and movies at the Putnam Museum & Science Center, visit putnam.org.